Like an emerald jewel Jasmine Tea perfume is deep green and sweet. Although Jasmine flowers and Green Tea are themed in this perfume, it is not quite as dry or floral as you would expect a Jasmine Tea to be – but indeed quite edible! Instead, it is like an earthy-herbal candied celebration of greenery. Blood orange opens the almost-culinary experience with fruity freshness, along with beautifully balanced floral heart of rich and full bodied jasmine (both Sambac and Grandiflorum) tea-like Osmanthus, and the sweetness of Rose and Rosemary absolute. The underlining base accord of Green Tea, Cedar Absolute and Fir Absolute along with the citrus and floral bouquet creates a sweet and earthy impression that is both warm and vibrant. The talented Lisa Fong from Artemisia Perfumes have created this perfume solely from natural essences. Lisa Fong’s style is that of refined elegance, which brings to mind Jo Malone’s perfumery, which emphasizes the individual ingredients. However, I do find these perfumes to possess a far greater depth and originality. 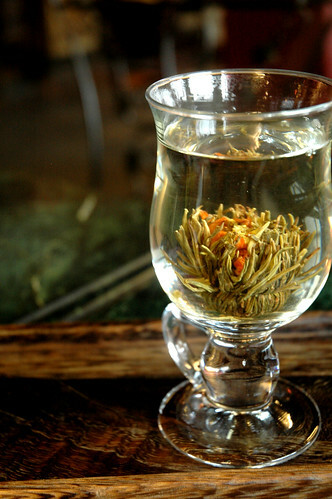 Of all her creations, Jasmine Tea is the sweetest – though not in the least cloying. It is an original and uplifting Gourmand.